The restaurant has overlooked the Market for the past 15 years but recently underwent a rebrand. It’s renowned for using ingredients straight from the market floor so I was looking forward to tasting the local, fresh dishes. Barry and I went on Thursday night and I was delighted to meet two old schoolfriends, Sarah and Carrie, whom I hadn’t seen since we were 18 years old- 13 years ago! Incidentally, they were heading to the ballet so had just eaten but said they had an enjoyable meal. The restaurant is very large with an open-plan kitchen so you can see the chefs cook in front of you. The setting is really lovely- particularly the spectacular feature windows. We were given two menus- the pre-theatre and the á la carte menu. As it was 7pm, we could have eaten of the pre-theatre which runs until 7.30, but other dishes on the main menu caught our eye. The pre-theatre is two courses for £14.00 and 3 courses for £16.50. For starters I picked the Vegetarian Bruschetta (£4.75) because it was the cheese which grabbed my attention. The dish is a large piece of Cooleeney Cheese (a creamy/buttery cheese with a white mould rind, made in Tipperary) with roasted red pepper and spinach served on grilled bread. I really enjoyed the dish as I’m a big fan of soft Brie and Cambembert-like cheeses anyway. 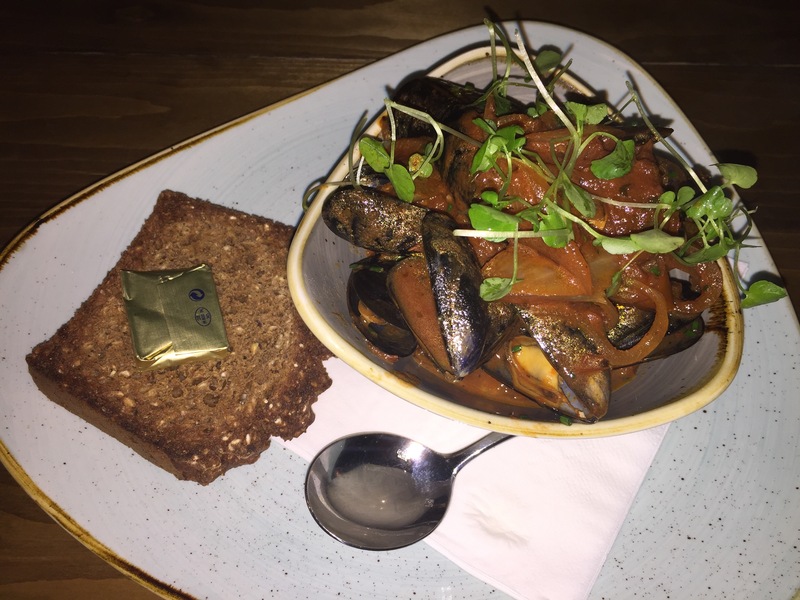 Barry went for the Arglass Mussels (£6.50), which came with Chorizo, white wine and herbs and served with a side of wheaten. I’m not a fan of seafood so didn’t try the mussels but I did try the sauce they were served in which was tasty. 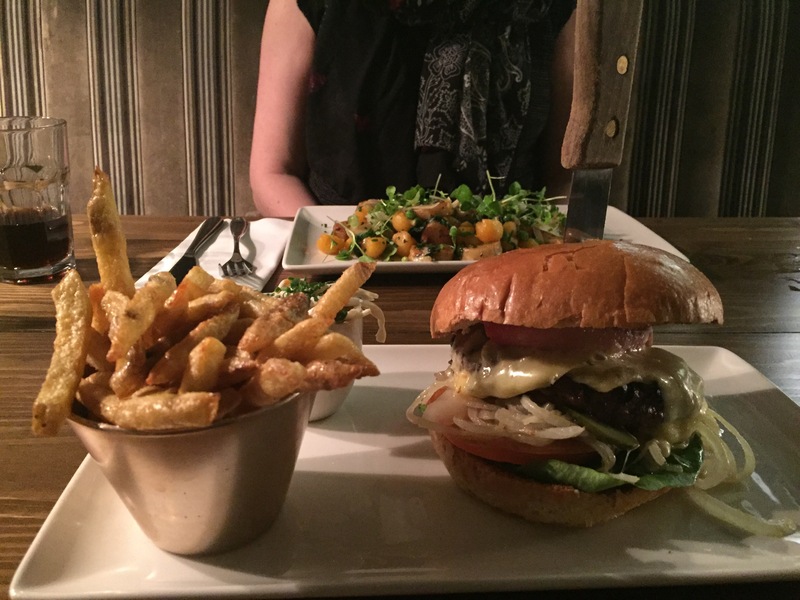 For mains, I was torn between the 6oz Irish Beef Burger (£12.95) and the Gnocchi (£12.95). In the end I went for the Gnocchi (another vegetarian dish) as Barry choose the Burger so I knew I could have a bite of his to taste! The Gnocchi came with pumpkin, peas, sage and parmesan cheese. There was no sauce accompaniment, just drizzled with olive oil I think, so I would have liked a little bit more flavour. Again, Barry enjoyed his burger to which he added bacon (extra £1) and blue cheese (extra £1). 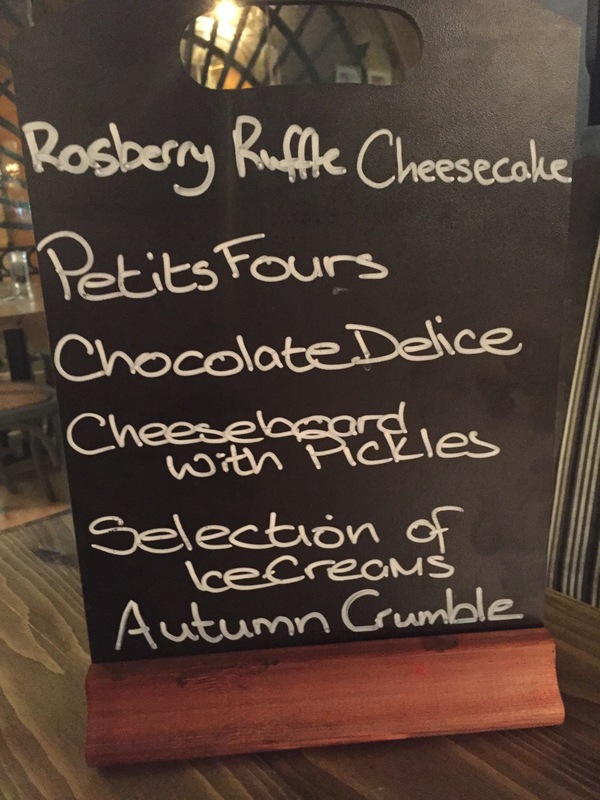 Finally for dessert I had my heart set on the Raspberry Ruffle cheesecake but sadly, they had run out! It must have been good! Barry was really full so could only manage some ice-cream while I picked the Petit Four. This was a mixture of fugde, chocolate truffles, berries and jellies. For me the highlight was the rich chocolate truffles covered in white chocolate- wow! Once I’d finished the first, I was delighted to tuck into the second! I would have preferred something other than a second piece of fudge but that’s only because I’m not a huge fan of fudge in general. All in all, it was a nice meal and the setting really made it. I’ve heard the Ulster Fry is its signature dish so I reckon I’ll have to get down to try it! Thanks to St George’s of the Market for inviting me! The burger and dessert look absolutely amazing !